The Director's Manual: A Framework for Board Governance offers current and aspiring board members essential up-to-date governance guidance that blends rigorous research-based information with the wisdom found only through practical, direct experience. The book's flexible approach to solving governance issues reflects the authors' belief that no two boards and the cultural dynamics that drive them are the same. As such, the advice offered reflects recognizable leadership dynamics and real world, relevant organizational situations. 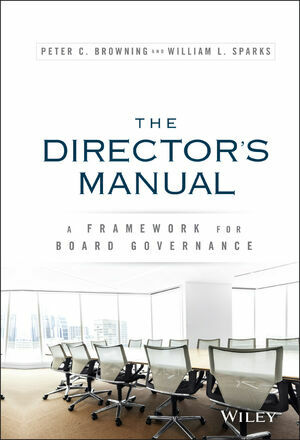 The Director's Manual: A Framework for Board Governance offers practical advice to guide you as you lead your organization's board. Peter Browning (Charlotte, NC; www.peterbrowning.com) is founder and Managing Director of Peter Browning Partners, LLC, a board advisory service. Their Board Advisory Services will help directors answer tough questions in the areas of board governance, board performance and dynamics, and leadership transition and succession planning. Peter is also a founding member of the Lead Director Network, a member of the faculty for The Conference Board's Directors' Institute and a frequent participant in governance seminars, serving on panels addressing a wide variety of corporate governance and compensation issues. He is a lifetime member of The University of Chicago, Council on the Booth Graduate School of Business; and served on the Executive Committee of the National Association of Manufacturers. William Sparks (Charlotte, NC; www.queens.edu) is a consultant on issues such as leadership, team development, succession planning, change management, and organizational culture. He is considered an expert in his field, helping high profile corporations such as the U.S. Navy, Transamerica, GlaxoSmithKline, Duke Energy, General Motors and the Department of Energy. He has consulted these clients through his own firm, William L. Sparks & Associates, as well as through Peter C. Browning & Associates, where he is a managing partner. Based on his extensive background and knowledge of the subject matter, Dr. Sparks founded Queens' graduate program in organization development (MSOD) in 2008. He is also responsible for the development of the leadership curriculum for all of the McColl School of Business' graduate programs.